It is very important to understand this Christ clue! As long as global wars and disorders exist, even if in zenith form of the future, the end is not at that time! Well then, you may ask yourself, how is it there can be no arrival of Christ, and the eventual “conclusion of the system of things” (Rev14), “the end”, as long as there are wars and global disorders? What gives here? As long as man rules, there’s always going to be wars and disorders!, you may say. Then how can Christ ever have a globally peaceful period of NO “wars and reports of wars”, the logical opposite development of globally active “wars and reports of wars”, that he can arrive into and honor the prophecy “the end” prerequisite? The SIGNAL global calm period of no “wars”, is the period of “world peace and security” that marks full 8th King world government. “World peace” will also mark the 8th King world government presentation in their final sovereign proclamation and signal “peace and security” period at global scale. 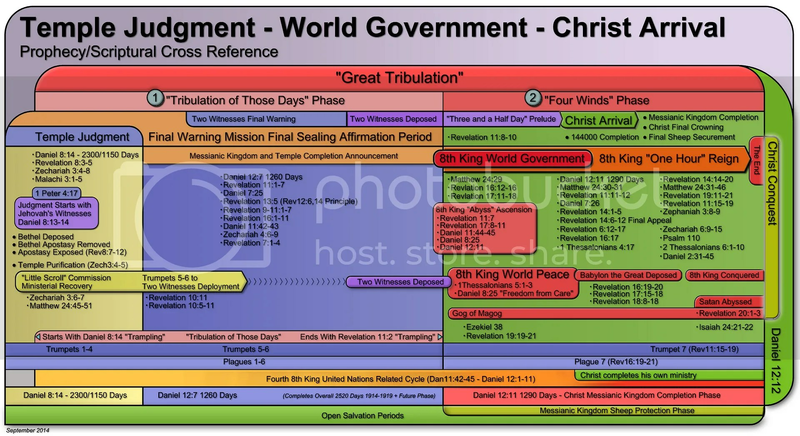 When the “tribulation of those days” resolves and recovers the global “crisis”, in the global “healing” “solution” of Revelation 13, and the 8th King final “abyss ascension” of Revelation 17:8-12, AFTER the peak period of global war and disorders resolves, then will be the signal period of NO “wars and reports of wars” GLOBALLY, as the 8th King world government “world peace everyone!”. That final signal period is what enables the end. As the global-crisis coming up, in time resolves, from the “7th King” “King South” “old world order” fall phase (Dan11:42-43), and then the global “healing” phase transitions into “8th King” “King North” world government, in that “tribulation of those days” ending to resolve into “world peace”, THEN is when there will be NO “wars and reports of wars” at GLOBAL SCALE! Instead it will be that unique signal 8th King world “peace and security” period of world government sovereign uni-polar power. (Daniel 8:25) And according to his insight he will also certainly cause deception to succeed in his hand. And in his heart he will put on great airs, and during a freedom from care he will bring many to ruin. And against the Prince of princes he will stand up (into world government as Daniel 12:11 parallel), but it will be without hand that he will be broken. “Bring many to ruin” “DURING” the signal “freedom from care” means that “bring many to ruin” agenda is “concurrent with” the final 8th King world government “world peace” period. The 8th King world government completing agenda of ALSO “bring many to ruin” is in that same final “world peace and security” period. Thus the 8th King, King North and King Fierce in Countenance are all synonymous with world government. (Revelation 14:9-11) And another angel, a third, followed them, saying in a loud voice: “If anyone worships the wild beast and its image, and receives a mark on his forehead or upon his hand, 10 he will also drink of the wine of the anger of God that is poured out undiluted into the cup of his wrath, and he shall be tormented with fire and sulphur in the sight of the holy angels and in the sight of the Lamb. 11 And the smoke of their torment ascends forever and ever, and day and night they have no rest, those who worship the wild beast and its image, and whoever receives the mark of its name. Thus the global final warning “two witnesses” ministry and the “Babylon the Great” global-religious institution, are slated for removal at that time. Both of these respective entities, are to be deposed in that same “bring many to ruin”, under world government, “during a freedom from care” of true global recovery and 8th King proclaimed and defined “world peace” and security final period. (Revelation 11:7-10) And when they have FINISHED their (1260 day) witnessing, the wild beast THAT ASCENDS out of the abyss will make war with them and conquer them and kill them. (Rev13:5-7) 8 And their corpses will be on the broad way of the great city which is in a spiritual sense called Sodom and Egypt, where their Lord was also impaled. 9 And those of the peoples and tribes and tongues and nations will look at their corpses for three and a half days (final pre Christ arrival symbolic period that must expire into Christ’s arrival), and they do not let their corpses be laid in a tomb. 10 And those dwelling on the earth rejoice over them and enjoy themselves, and they will send gifts to one another, (in that “freedom from care”, still fully functional world system in global “healing” recovery) because these two prophets tormented those dwelling on the earth. (Revelation 16:14-16) they go forth to the kings of the entire inhabited earth, to (globalization) gather them together to the war of the great day of God the Almighty. …16 And they gathered them (fully globalized) together (world government) to the place that is called in Hebrew Har–Magedon. Thus the “tribulation of those days” unique global crisis “global-problem” signal transitional period is required to fully run its “wars and disorders” climax phase, to resolve into “world peace” and global recovery “healing” to form the full “8th” “King” world government “global-solution” presentation, acceptance, and final divinely permitted “one hour” of true “8th King” “King North” global reign. This is why this global-crisis period coming up, to define the “7th King” synonymous “King South” national system downfall (Dan11:42-43), to enable that final 8th King rise into full world government, is NOT “the end”, ” the end does NOT occur immediately”. All this “must occur” first, as per prophecy and required final globalization development (Rev16:13-16), which uses the national sovereign downfall period to consolidate total global “power and authority” into the 8th King world government “ascension”. Now Bethel, as the modern apostasy that is also dealt with, first (1Pet4:17), in the temple judgment (Dan8:13-14; Zech3:1-5), is deluding JWs with a prematurely promoted “end of the world next brothers!”. (2Thess2:1-2) Bethel does this by bypassing all commentary on the logical meaning of Matthew 24:6 and Luke 21:9, and the required 7th King downfall and eventual 8th King world government rise and its signal world “peace and security” final period. Now who, “in the temple” of claimant anointed Christians, “lifts themselves over everyone?”. The Bethel elites, and their talking head Governing Body, ” sits down in the temple of The God, publicly showing himself to be a god” as the latest “apostate clergy” JW hierarchical add-on. (Daniel 8:11) … from him the constant [feature] was taken away, and the established place of his sanctuary was thrown down. (Daniel 12:11) “And from the time that the constant [feature] has been removed (in second two witnesses deposition of Rev11:7) and there has been a placing of the disgusting thing that is causing desolation (in fourth and final 8th King UN world government placement; Dan11:45; 8:25), there will be one thousand two hundred and ninety days. All that “gathering” is occurring under the full rival 8th King world government world “peace and security” culmination period, the “four winds” period of parallel Matthew 24:31 and Revelation 7. That is how “the end” comes, for the rival 8th King system, when there are NO “wars and reports of wars” AT GLOBAL SCALE—it is then “the end” can come. To understand the seven seals, one must understand what a “seal” is a symbol of. A “seal” is a divine “secret” only God knows. It is a symbol of a divine secret as long as it is “sealed”. Thus God already understands what is in each of the “seven seals”, he is the Sealer of the seven seals of the “sacred secret”. Thus the significance of Christ being divinely worthy to “open” the “seven seals”, is God selecting and allowing Christ to understand the prophecy contained in the seven “seals” first—to “open the seal” is to understand what is within the “seal” before the nested prophecy in that “seal” transpires. Thus when the seals were opened, Christ gained the initial overview of the full prophetic outworking of God’s “sacred secret” purpose, one time, in full, when he opened all seven seals sequentially in 1914. The seven seals are already “opened”. This means Christ as appointed temporary King in God’s Kingdom, was shown these things first to oversee their full fulfillment later to proceed to the Messianic Kingdom completion portion in time. The seals opened once, when Christ was given full understanding of what was inside of each seal and thus the whole two sided scroll. Thus Christ opening all “seven seals” is his full understanding of the entire Revelation which he delivered to John from God as a “sacred secret” final revelation he could not understand at that time—only God Almighty initially understood the “sacred secret” fully, which the “seven seals” “scroll” details by the deeper prophecies within those seals that were shown to Christ in 1914. Thus God allowed the seals to be opened to Christ, by Christ, to allow anointed Christians to understand “what must shortly take place”, so that they could tell everyone all about it before it all fulfilled fully. Now you can understand why those trying to explain the “seven seals” as sequential prophecies of the future, with no understanding of what a “seal” symbolizes, will make errors in the imagined sequence. When it comes to the seventh seal, the seven trumpets deeper prophecy was understood by Christ since 1914, that “seal” has already “opened” and is fully understood by Christ. Thus the events that take place in the seven trumpets nested prophecy of the future, known by Christ now within that seal’s full symbolic understanding, are what is to fulfill in the future, in final cycle form as the “seven trumpets”, not the already “opened” seven seals overview. Yet the events in the seven trumpets (Rev8-11) and its parallel seven plagues (Rev15-16), will respect the sequence of events in the seven seals, which first four seals are already the global war accelerant developments of those symbolisms that began with World War One as the world war theme was set for the rest of the century in 1914-1918 first cycle. Like the “sign” in Matthew 24, the intensity of the first four seals global “horse” ride will intensify to completion in the future. But the quadruple “horse” ride did all begin with WW1. The detailed prophecies the seals contain are separate nested prophecies that will fulfill later. What is inside of those seals are the actually further nested prophecies, that all take place fully in the “seven trumpets” and “seven plagues” which are the actual global manifestations of those prophecies of future trumpets and plagues which are nested in the “seventh seal”. The “seals” are not the future prophecy, they are already “opened” to Christ’s complete understanding from back in his God’s Kingdom installment, to carry all this out as God’s anointed King. The unique feature of the “seven seals” is that it is a prophecy in itself, that contains other nested prophecies within the “seals” that fulfill later fully. No other prophecy is structured like the “seven seals”. The “seven seals” also contain the “seven trumpets”, that is unique. The seventh seal “seven trumpets” fully explain the whole sequence of the first six seals, in greater detail of how the sequence is to actually unfold with the seven plagues from the temple judgment activation (Rev8), to the ministerial recovery (Rev9-10), to the final warning (Rev11:17) in the “tribulation of those days” to conclude into 8th King world government and then Christ’s arrival (Rev11:7-13), for Messianic Kingdom completion, final sheep securement and 7th Trumpet final universal and global conquest (Rev11:15-19) of God and Christ, the whole point of the seven trumpet overview. The whole prophecy used to be a secret even unknown by Jesus Christ; at one time, only God Almighty understood what was in those seven seals, thus what the entire scroll contains. The seals are symbolic of sealed, therefore secret, divine information, that when unsealed are symbolic of Christ “the Lamb” coming to full understanding of what the “seal” contains when he “opens” it in actual understanding of future events and tasks for Christ’s understanding first. The “seven” is Christ’s full understanding of God’s purpose in how the final prophecies must unfold fully, in every detail, for he is involved in their final fulfillment. (Revelation 5:6) And I saw standing in the midst of the throne and of the four living creatures and in the midst of the elders a lamb as though it had been slaughtered, having seven horns and seven eyes, which [eyes] mean the seven spirits of God that have been sent forth into the whole earth. The seals opened are symbolic of Christ fully knowing from God, how God’s “sacred secret” is fully revealed first, and brought to a finish in the subsequent seven trumpets prophetic fulfillment which is nested in that seventh seal, already now fully understood by Christ before it all unfolds, to carry it all out fully in the future. (Revelation 10:8-10) And the voice that I heard out of heaven is speaking again with me and saying: “Go, take the opened scroll that is in the hand of the angel who is standing on the sea and on the earth.” 9 And I went away to the angel and told him to give me the little scroll. And he said to me: “Take it and eat it up, and it will make your belly bitter, but in your mouth it will be sweet as honey.” 10 And I took the little scroll out of the hand of the angel and ate it up, and in my mouth it was sweet as honey; but when I had eaten it up, my belly was made bitter. Thus we can see why those explaining the “seals” as if they are a sequential prophecy of the future, do not understand the basic symbolic meaning of the “seal” itself, and how it is already “opened” to Christ, by Christ, by God’s appointment and decree. And that is why the overview in all six first seals opened to Christ’s mind, is fully explained within the “seventh seal”, already opened to Christ, in its seven trumpets content, which are the sequential future prophecy yet to fulfill in full form that completes the whole thing for real, in the future. Therefore it is the seven trumpets that fulfill in the future, not the “seven seals” which have already opened to Christ’s full understanding since 1914. Of course those doubting 1914 will not see the significance of Christ’s required full understanding given by God first, in His Kingdom first, to oversee the whole future unfolding of the entire “sacred secret brought to a finish”. Thus the logic is God gives Christ full prophetic insight to guide the Messianic Kingdom completion process over the intervening time period of the first witnessing of Jehovah’s witnesses since the 1914-1919 first main cycle. And thus the original Jehovah’s witnesses explanation of Revelation is a valid preview fulfillment that has accompanied Christ’s divine empowerment as King of God’s Kingdom since 1914. But that is not the only Kingdom Christ will assume the kingship in. (Daniel 2:34-35) You kept on looking until a (Messianic Kingdom) stone was cut out not by hands, and it struck the (complete 8th King world government) image on its feet of iron and of molded clay and crushed them. 35 At that time the iron, the molded clay, the copper, the silver and the gold were, all together, crushed and became like the chaff from the summer threshing floor, and the wind carried them away so that no trace at all was found of them. And as for the stone that struck the image, it became a large mountain and filled the whole earth. And this is why Revelation’s main cycle will repeat in final form in the future, to lead to the developments that will signal that required Messianic Kingdom completion before it fully culminates. Thus just as the initial preview fulfillment manifested with God’s Kingdom activity in regard to Christ’s Kingship there to oversee the rest of the ministry, the final fulfillment of Revelation will manifest with the Messianic Kingdom completion drive in regard to Christ’s final Kingship in that Kingdom entity as well. This is why there will have been two witnessings when this all completes. All of Revelation 8-11 will then progress sequentially in the seven trumpets activating, once the temple judgment portion activates Revelation 8 temple judgment parallel for final cycle fulfillment in the “tribulation of those days” phase beginning, that leads to 8th King world government completion first (Rev11:7; Rev17:8-12), then Christ’s arrival, as that “tribulation of those days” expires first. This is because “new world order” world government complete, functional (Dan11:45, Rev17:8-18) and stated (1Thess5:1-3), triggers Christ’s arrival, not before, but AFTER it completes, when they are good and ready. That takes several more years even from the beginning of the temple judgment and the “tribulation of those days” transitional phase of the overall “great tribulation”. Thus the “four winds of the earth” phase (Rev7:1-4; Matt24:31) transpires under full 8th King world government because the final anointed affirmation sealing takes place as the final warning commission is carried out fully (Rev10:5-11; Rev11:1-7; Zech3:6-9), which final sealing enables the “four winds” phase as the “tribulation of those days” ends with that 1260 days. (Revelation 5:1-5) And I saw in the right hand of the One seated upon the throne a scroll written within and on the reverse side, sealed tight with seven seals. There is a fulfillment cycle concerning both of the Kingdom developments in God’s Kingdom and the later Messianic Kingdom fulfillments each of which will have a full “little scroll” “witness” in the “two witnesses” to announce the certainty of the prophecy now leading to the Messianic Kingdom completion cycle. The reason for this latest “Gog of Magog” update is to converge all the “UN attack on false religion” and Russian related “King North” delusions into one handy premature end “self fulfilling prophecy”, recently summarized and refreshed in the JW mind, to sell the coming Bethel deposition of the temple judgment (Dan8:13-14), as if it is the terminal “great tribulation” to proceed directly to “the end”. ====Image and over-simplified formula from Watchtower 5/15/2015 Study Edition. 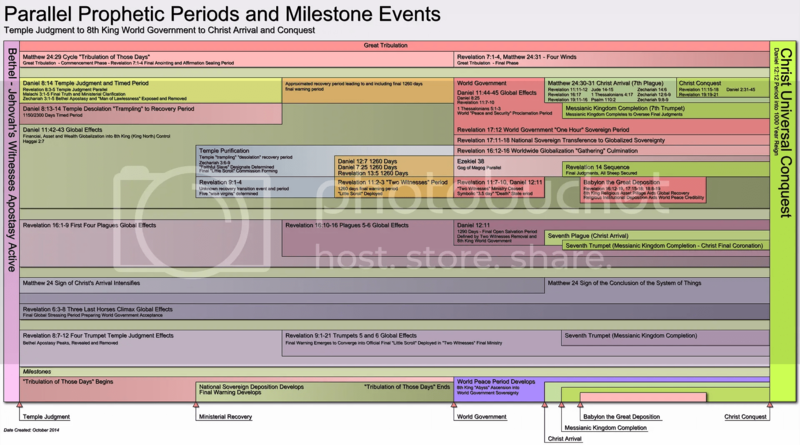 Now events on Bethel that will start the “tribulation of those days” can be made to appear to JWs as the total end. In this deceptive manner, Jehovah’s witnesses will be thrown instead into a global hoax by the use of the over advanced and rearranged prophetic interpretations recently overrun by apostate Bethel for this very purpose. (2 Thessalonians 2:3-5) Let no one seduce you in any manner, because it will not come unless the apostasy comes first and the man of lawlessness gets revealed, the son of destruction. 4 He is set in opposition and lifts himself up over everyone who is called “god” or an object of reverence, so that he sits down in the temple of The God, publicly showing himself to be a god. 5 Do you not remember that, while I was yet with you, I used to tell you these things? What will be coming on Bethel will be the full manifestation of Daniel 8:11 and Daniel 11:41 as Daniel 8:13-14 temple judgment “trampling” phase for the UN NGO “transgression causing desolation”. (Daniel 8:11) And all the way to the Prince of the army it put on great airs, and from him the constant [feature] was taken away, and the established place (Bethel JW worldwide organization) of his sanctuary was thrown down. What we basically have is Bethel bypassing the required real events of King North globalist 8th King system expansion of Daniel 11:41-43 of the “old world order” transition in the coming 7th King (King South) nation-state system sovereign fall, to 8th King world government rise into the “new world order” (Rev17:8-18; Dan11:41-45). What is really coming is world government “order from chaos” from a final period of “tribulation of those days” chaos to bring the nations to their knees as the “tribulation of those days” is to resolve into, not “the end” immediately, but into 8th King FULL WORLD GOVERNMENT first. The “sword stroke” to “healing” cycle of Revelation 13 is this same preparatory period for world government final presentation. The full Revelation 17:8-11 abyss rise of the full 8th King into world government “one hour” of Revelation 17:11-18 is the same parallel of global development. Thus Bethel is OVER ADVANCING JWs too far into the prophecy “to the effect the day of Jehovah is here” premature of reality (as per 2Thess2:1-2), to sell the upcoming “tribulation of those days” phase in peak global “sword stroke” developments as simply “it is the [1-2-3] end brothers!”. …is perfectly deluding JWs to misperceive these coming events of severe global financial difficulty (Dan11:42-43), as if it is “the end” well premature of reality. Thus when Daniel 11:41 fully manifests on the JW organization as the “trampling” of Daniel 8:13-14, they can sell that temple judgment desolation for massive Bethel sins and UN NGO, as “the attack of Gog of Magog”, and this si why they have revisited that Gog teaching to continue to prime the JW collective brain for these coming events, so as to perceive them in error. At such time the current JW delusion complex of a handy “self fulfilling prophecy”, will become a true JW hoax, for it cannot be the end yet, for a number of reasons. And as we see per Watchtower 7/15/2015, they are programming that JW org downfall phase so as to also try to draw in more JWs and xJWs and interested ones, with the “respite” they are now deceptively teaching for this future anti-JW operation. They intend to get full JW resources and support so that JWs can actually aid the Bethel deposition process. 6 How will God’s people fare at that time? Jesus explains: “In fact, unless those days were cut short, no flesh would be saved; but on account of the chosen ones those days will be cut short.” (Matthew 24:22) As we considered, in 66 C.E. the tribulation was “cut short.” This allowed “the chosen ones,” anointed Christians, to flee the city and its environs. Likewise, the initial part of the future great tribulation will be “cut short” because of “the chosen ones.” The political “ten horns” will not be allowed to annihilate God’s people. Rather, there will be a brief respite. Obviously Bethel is planning to use the JW org, to attempt to herd JWs to capture globally “at that time”. 1. Apostasy precedes a world power transition, this one into world government. In [apostate] Israel in the 8th century BCE, when [Assyrian world power transitioned in], and sacked IDd apostate Israel in Samaria and Bethel cities and region [as a divine foretold judgment marker] of Hosea 1:4-7 and Isaiah 28 (among other warning prophecy); this apostasy-to-judgment-to-new world power emerged for the 1st time. In [apostate] Jerusalem in the 7th century BCE, when [Babylonian world power transitioned in], as a [foretold judgment marker] allowed a total sacking of Jerusalem and all Israel; this apostasy-to-judgment-to-new world power emerged for the 2nd time. In [apostate] Jerusalem in the first century CE, when [Roman world power transitioned in] and sacked Jerusalem and all Israel as a [divine foretold judgment marker]; and this apostasy-to-judgment-to-new world power emerged for the 3rd time. The point being a SIGNAL APOSTASY, SEEN BY SOME, WARNED IN PROPHECY and from some, ALL develop [[with]] [a major world power transformation]. That is no coincidence, and by then it was a common pattern. It took them a little time to recognize the specific world power transformation emerging as official in Anglo-American [nationalist] alliance, AND the [globalist] developmental nucleus of world government in that League of Nations presentation. Bethel apostasy is NOW emerging, with its own DELUSIONAL “the end is near!” smokescreen (2Thess2:1-2) so the final cycle also gearing up to transition into world government, can be concealed from JWs, while a great global transition, AGAIN, the BIG ONE, is clearly forming with SIGNS in the system itself as per Luke 21:25. This NOW CERTAIN apostasy-to-judgment-to-new world power will now emerge for the last time into 8TH KING WORLD GOVERNMENT along with the sacking of Bethel. In ALL cases, the world power coming in, sacks the apostate system. BETHEL APOSTASY IS NOW THE FINAL SIGNAL OF THE SAME PATTERN. The same guys behind the UN NGO, the 8th King planners, is who will also sack Bethel in the future, hence Daniel 8:13. And from then, the 8th King will “ascend” into the next global power system. The Bethel apostasy is therefore just one more of those “signs in” the JW “lights”, in their “sun” at Bethel, hence Revelation 8:10-11 “fallen star” clearly applying NOW to developments inside of fallen APOSTATE Bethel. APOSTATE Bethel is who is fallen from the “holy covenant” (Dan11:30b,32a), that that relative “they” at anointed claimant Bethel, were paramount in IDing for our time (long ago now, 1914 to 1969+/-), as at one time a genuine anointed Christian “reformation” was being summarized, BEFORE that “star” fell into [signal apostasy], now called Wormwood Bethel. It is the 2Thess2:3-4 apostasy that has to be globally judged, “revealed” as fully globally exposed, BEFORE the real “day of Jehovah” can fully manifest as in 2Thess2:1-2 premature delusion of that “day”, that Bethel now uses to divert the JW mind with over excitation as if “the end is next brothers! the end is near! forget all else, it is the end we tell you, the end!!! Forget to look at prophecy (WT3/15/15), it IS THE END!!! THAT is the CENTRAL JW DELUSION AT BETHEL, that is the 2Thess2:1-2 warning Paul was giving by inspiration, to NOT be fooled by this hype; BECAUSE the APOSTASY AND MAN OF LAWLESSNESS AT BETHEL, has to be revealed first, THEY are the source of that KEY SIGNAL subterfuge. 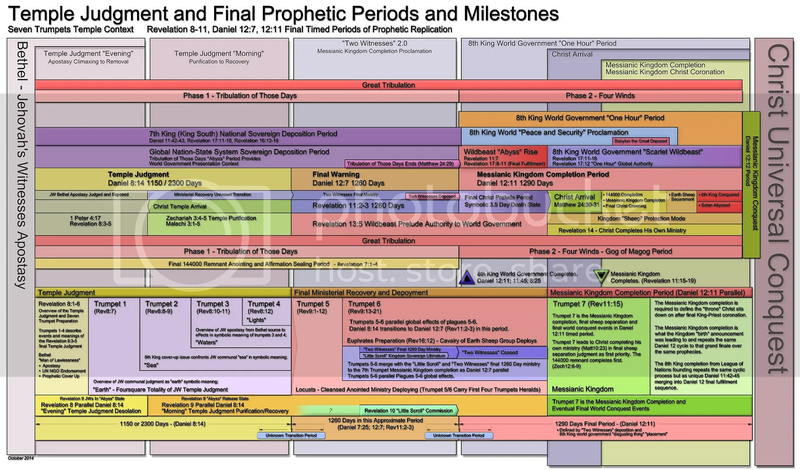 So it is ALL the same thing, again, and it will form all the main points again, hence Rev10:11 eventually will emerge as “you must prophesy AGAIN” with regard to that “little scroll” previewed from the days the JW vessel, was actually guided by anointed Christians, and they did EXPOSE the enemy system at the same time, for a while—but no more. War Present Globally? Then It Is Not The End Yet! Statement: Armageddon is the Final Battle…GOD’s War. Har-Mageddon, the global “(har) mountain” “(mageddon) of the military monopoly”, WAR of God Almighty, comes under global conditions of “world peace” and security, or Daniel 8:25 “freedom from care”, which is the same world peace time of recovery. AS LONG AS ONE HEARS OF “WARS” IN THIS WORLD, THE END CANNOT COME. THUS THE REAL END COMES UNDER WORLD GOVERNMENT “WORLD PEACE AND SECURITY”, WHEN THERE WILL BE [NO] WARS AND REPORTS OF WARS; Thus 1Thess5:1-3 signal period. DO NOT BE MISLED, OR “excited either through an inspired expression or through a verbal message or through a letter as though from us” [apostles/anointed], exactly as Bethel is doing now to deluded JWs way too soon for the real end under world government that takes more years to run the final cycle, and to complete and present globally. As we know old school Jehovah’s witnesses, as part of the original Kingdom proclamation, did expose the globalist world government development as the formative League of Nations (Rev13:11-15) and United Nations (Rev17:8-11) “image” and wildbeast developments in their 1919 and 1945 UN related manifestations. By the time of 1963-1969, Bethel had connected the UN developments to Revelation prophecy in publication form. (That formed the basis of the Revelation – Grand Climax book of 1989, but it was all known by 1969). Thus by 1969 JWs had gotten as far as they were going to in spiritual enlightenment. There has been no true “new light” since 1969. The Fred Franz death marked the death of any “new light” from now apostate Bethel. It is all plagiarization of the past, and smoke and mirrors at Bethel. World government is not the “image” it is the real thing that must complete, the “scarlet wildbeast” totality of 8th King world government meaning. (Rev17:11-18) Bethel covers this completion logic over. Thus JWs who did track the first two UN manifestations as prophecy, have now stopped tracking the last two UN manifestations as relevant since 1990, the last of which is the 8th King world government placement of Daniel 11:45, 12:11. Daniel 8:25, 11:45 and 12:11 are the explicit “placements” and “stand” of world government. Thus Bethel ignoring Daniel 8:23-25 and Daniel 11:30-45 as actually 8th King sovereign convergence prophecy in the “King of Fierce Countenance” and “King North” is also ignoring the final WORLD GOVERNMENT PLACEMENT. 1. Bethel is NOT explaining the most significant feature in rival 8th King development, the manifestation and presentation of actual WORLD GOVERNMENT. 2. Bethel is therefore ignoring all 8th King development in the book of Daniel completely. 3. Bethel is covering up the final 8th King cycle of Daniel 11:42-45. 4. Bethel is concealing the connection of Daniel 11:42-45 to Daniel 12 final fulfillment final world government cycle. 5. Bethel is concealing the explicit wealth and financial nature of Daniel 11:42-43 that US and EU sovereign debt developments will aid the full activation of. 6. Bethel is prematurely applying Daniel 11:44 attack scenario to aid cover up among JW of the coming Bethel downfall. 7. Bethel is covering up the UN NGO related temple judgment of Daniel 8:13-14 because Bethel is also concealing their own key apostasy in the Daniel 8:11-14 and Daniel 11:30-35, 41 parallels to 1990 and the 3rd UN placement. 8. Thus Bethel wants to cover-up their own guaranteed “trampling” desolation (Dan8:13) with a premature “Armageddon” expectation. Bethel will be removed by God and Christ (Zech3:1-5) to allow the true final cycle details to come forth (Rev10:11; Rev10-11) in that tribulation context globally as it proceeds to the tribulation resolution (Matt24:29-31; Rev16:12-17) for the world “peace and security” effect to aid world government final presentation that the three previous UN cycles and renditions have been leading to. Bethel is judged as the final apostasy to allow the final Kingdom warning to come forth and the recovery of the Christian ministry. 1. World Government [must complete] BEFORE Christ arrives, and this is very very important to comprehend. 3. What Bethel also conceals is the FACT the “great tribulation”, in both of its phases as “tribulation of those days”, that plainly expires BEFORE Christ even arrives (Matt24:29-31, Dan12:7, Rev13:5-7, Rev11:1-7), and the “four winds” “of the earth”, under full 8th King world government (rev17:12 “one hour”) final agenda (Rev7:1-4, Matt24:31), are ALL OPEN PERIODS OF OPEN SALVATION—it is never too late, until the very very end, hence Matt25:41-46, Rev14:17-20. Of course that is a very important detail for people to become aware of now and in the tribulation period. 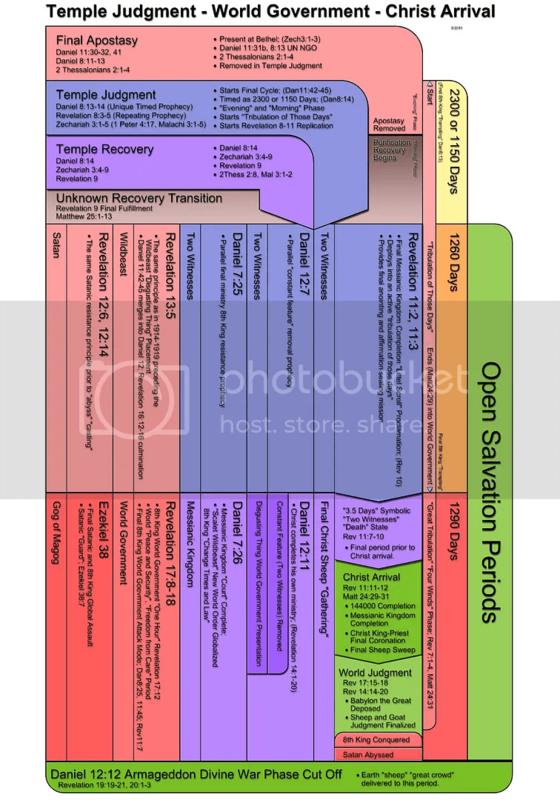 As per Revelation 14, post Christ arrival sequence (Matt24:29-31, Rev11:11-12 begins Rev14), even AFTER Christ arrives in that Daniel 12:11 period, people can still be saved as backed by angelic aided final proclamations of such salvation opportunity as per Revelation 14:6-11. And that means even in the Babylon the Great judgment, still a present entity, and progressing to termination under 8th King complete world government (Rev14:9-11), people can also still and will be saved (Rev14:6-8, Rev11:13, Rev17:15-18) as that judgment finalizes (Rev14:14-16) BEFORE the absolute end of Revelation 14:17-20. The UN NGO tells us what Bethel really is.